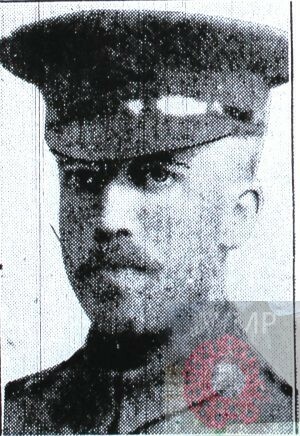 Died: 22nd September 1916; age 28; Died of Wounds to the thigh, received in action at in the big advance, at Number 5 General Hospital, Rouen. Residence: 16, Lady Lane, Chelmsford, Essex. Occupation: Printer’s Compositor – Mr John Dutton, Tindal Street, Chelmsford. Served his apprentice as a Compositor at the East Anglian Daily Times, Ipswich. Enlistment Location: Romford, Essex; Date: 15th November 1915; Age 28 years & 2 months. Next of Kin: father – William Elliston – 78, Camden Road, Ipswich. Height: 5ft 5 1/2 ins. Date of Entry Therein: May 1916. Wounded in Action – 15th September 1916 – in the thigh – operated on as treatment. Rank: Corporal; Service Number: C/7540. Regiment: King’s Royal Rifle Corps, 18th Battalion (Arts & Crafts Battalion). Relatives Notified & Address: Son of William & Annie, of Ipswich; husband of Ada Jane Elliston, of 16, Lady Lane, Chelmsford, Essex. 1891 42, Alexandria Road, Ipswich. William was 2 years old and living with his parents. William Elliston, a Plasterer, born Ipswich. Annie Elliston (nee Ungless), 27, born Ipswich. 1901 28, Handford Road, Ipswich. William was 12 years old and living with his parents & sisters. Ethel Annie Elliston, 6, born Ipswich. Elsie Harriet Elliston, 2, born Ipswich. 1911 2, St. John’s Road, Chelmsford, Essex. William was 22 years old, a Compositor – Printer. He was a Boarder at the family home of 61 year old, William Trigg, a retired Coachman. In May 1913 William was elected Honorary Secretary of the newly formed Chelmsford Printing & Allied Trades’ Athletic and Social Club. On the 19th February 1916, at St. John’s Church, Moulsham, William married, Ada Jane Barker, born 10th July 1883, Witham, Essex. Gold signature ring, wrist watch, cigarette case, pipe, mirror, platoon roll & linen bag. Soldiers’ Effects to Ada J. Elliston – widow. William is also remembered on the Civic Centre Memorial, Chelmsford, and the Moulsham Parish Memorial, St John’s Church, Moulsham.